Agree, it's very enjoyable and the engine seems to be solid. Now I'm going to explore the limits of the drivetrain on slicks this weekend if the weather holds. This wasn't the original plan but I've managed to make it work. With a 6 psi spring in the gates and the controller off, it is very predictable with a ramp to 20 psi. It's almost like being on a progressive with two kits, one small and one large. However, it's a handful on the street with the controller on and 20 psi very early. Thanks, you were right. It still needs a few tweaks but everything is working out. I think I may still need a different tire for the street to maximize the potential. You running the Quick 30 on Sunday? I may come out and cheerlead for you. I went to the track last night for some additional tuning and a little practice. 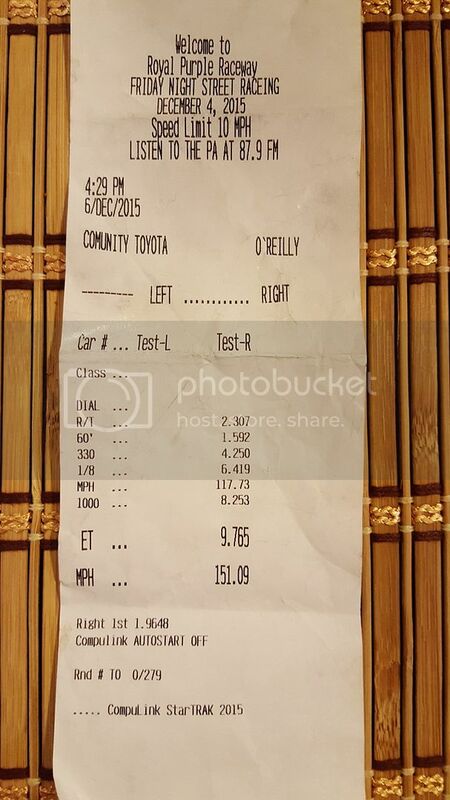 Here was the best pass with it spinning the tires at 140 mph on 18" drag radials and the controller turned off. Last edited by Turbo-Geist; 12-06-2015 at 08:24 AM. What were u hitting for boost? Tires started spinning @ 140 mph and we're turning 158mph when I crossed the line. Boost is 9 psi @ the start of each gear and creeps to 20 psi by redline. Last edited by Turbo-Geist; 12-06-2015 at 10:19 AM. cheering from the west coast! This wasn't his quickest pass but it was a clean one. I'll let him post his new PB..
Good angle, Mark. I think this is where I'll find some ET. Left side of split screen is from the old combo. 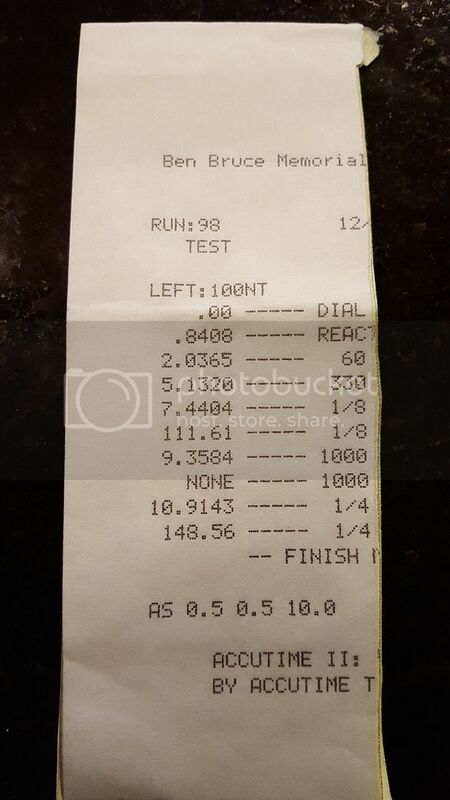 At 100% tps it was at full target boost. The new combo takes 1.25 seconds to hit full boost after 100%. I have a light spring in the gates and they aren't responding quick enough with the controller. Last edited by Turbo-Geist; 12-06-2015 at 11:26 PM. Congrats Ben on a NPB and a great shakedown day at the track! I'm happy for you bro! That thing is moving! One hell of trap speed. Thanks, Jeff. Glad I landed in the targeted range that we discussed for a 1st trip. I think once I get it to make full boost on each shift, the ET will drop more. It rolls on the big end. Glad you made it out there. Looking forward to seeing your car running again. Thanks, it felt great. Hoping to go even faster next outing. You are killing it for having so little wheel time in a few years. What rear wheel/tires again? I thought they were a full hoosier slick in 28" x 10" x 17" on a zr1 17" x 10", but not sure. I'm debating on a qtp in 11.5" or the 10" slick. I noticed you are using the MGW shifter now so curious if you like it over stock? -Changing four tires in the parking lot with hand tools and a jack is not very enjoyable. Glad the weather was nice and cool. -Finally it was time to make a pass with the controller off. I think it went 10.41 @ 141 because the ramp is so slow with the 6# spring in the WG. -I started playing around with the controller. On the 9.99 @ 148 pass, the driver side window popped out and dropped down into the door. We spent almost another hour in the pits, pulling the door panel, fishing the window out and getting everything re-aligned. Thanks to Jon, Joe, Bill, Jeff, Alan, and anyone I forgot for their help on this one. -Back to the starting line. This would have been a beautiful pass, but it went into REP mode in the middle of the launch. 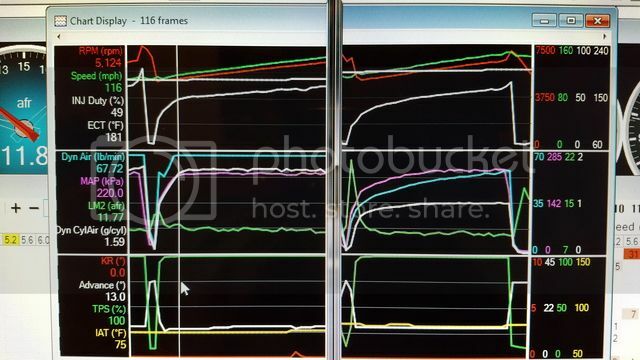 The computer freaked out because the airflow was greater than it thought it should be for the throttle angle or maybe the blade was open more than commanded. (1515 code). I told it to ignore the code and went back for one more. -Last pass was [email protected] I probably could have made one or two more but I was beat. I hadn't eaten since 8am and it was now 3:30pm. I still had to drive the car home and needed to bolt the drag radials back on for the ride. Thanks, man. I was a little rusty after being away for 2 years. The shifting got better each pass. I just need more practice. The rear wheels are a 17X10" Fikse Profil FM5 and Hoosier slick 17 x 10.5 x 28. I'm really happy with the MGW shifter and the 6060 trans. I didn't have to think much about shifting. Just need to practice and get quicker. My shifts for this trip were in the 0.2s range. I used to be 0.15 to 0.1s range. Looking to get to 0.1s or quicker after I get everything lined out. It's tough being the mechanic, tuner, driver, and pit crew all at the same time. This is how it goes with a new combo. It should be even better next time. I like the 2763 from Milwaukee. Last edited by schpenxel; 12-07-2015 at 11:02 AM.